How to choose the right drum mixer? What are my mixing goals? Am I performing a primary mixing or simply re-blending separated or settled material in a 55-gallon drum? How many 55 gallon drums do I need to mix or blend? Are all the liquids contents in the drums the same product or do I need to be concerned about cross-contamination? Do I need at add heat in order to reduce the viscosity and reach a pourable? What’s most important? Speed, Easy of use, safety, sanitation, cleaning or other? Do I need shear mixing or non-shear mixing? 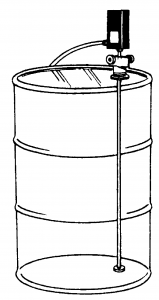 Most of the time, the operator simply wants to completely mix or re-homogenize the liquids in the 55-gallon drum as quickly as possible. By quickly releasing large compressed air or gas bubbles right on the bottom of the drum, the operator does not have to move the 55-gallon drum to a special drum roller or drum rotation devise. These expensive contraption simply roll the air pocket back and forth in the drum and set up for these can take a lot of time. Pulsair accomplishes the same thing in minutes. 90-95% of the time, drum mixer operators are usually re-blending separated liquids or liquid solids that have settled out over time or transport. The non-shear mixing process of sequentially injected bursts of air/gas can re-blend or re-suspend settled solids quickly. Mixing a lot of drums can take a lot of time if all you have is big drum roller or drum rotator. Why not leave the drum in it’s current location and quickly mix it with a drum mixer that weight less than 3 lbs.? Pulsair has best drum mixers solutions. The Pulsair 5-55 Drum-Stick includes a separate 40″ stainless steel mixing probe that can be quickly removed from the controller. Multiple probes can be purchased for less than buying a separate 55-gallon drum mixer for each product. 55-gallon drum heater bands or blankets can be added to the outside of the drum to raise the temperature of the liquid product in order to reach the desired temperature for pouring or other requirements. Periodically rotating the liquid across the heating surface can significantly reduce the time-to-temperature. Pulsair has proven that heating and mixing can reduce heating time and improve processes with rail tank cars but as much as 50%. The Pulsair 5-55 Drum-Mixer is safe to use. It weights three pounds and can operate on compressed air or inert gas making it ideal for explosion proof areas. All Pulsair 55-gal drum mixers are built for food-grade mixing standards and are very easy to clean and maintain. In addition to 55 gallon drum mixers, Pulsair has solutions for IBC tote mixing, rail tank car mixing and custom mixing tank solutions for any size or any number of tanks. Call Pulsair today to learn more about this fast, efficient tank mixing process that mixes, agitates and blends any type of high solid or high viscosity liquid in any 55-gallon drums.